Metal Inert Gas (MIG) welding is the type of welding most commonly used by industries and manufacturers1; however, some industries are more likely to use this form of welding (and/or offer more job opportunities in this field) than others. Following is an overview of the sectors that use MIG welding the most and are thus most likely to hire welders who have professional qualifications in this field. MIG welding is most commonly used to repair cars, motorbikes, recreational vehicles, vans and SUVs2. The fact that it can provide a strong weld for even very thin metals makes MIG welding the ideal technique for assembling and repairing the body and/or interior of any vehicle. MIG-welded metals are also extremely versatile, a must for vehicles that need to hold up to many years of use. More and more vehicles are being made from aluminum, a material that is traditionally welded using a MIG welder. Given this fact, it is likely that MIG welding will be used to manufacture cars well into the future. However, it is important to note that many car manufacturers are switching from traditional MIG welding to laser MIG welding. The latter form of welding has numerous advantages, offering higher process stability, deeper penetration, greater ductility and more at a lower cost than traditional MIG welding. Steel is the most commonly used metal in construction. In fact3, over half of the world’s steel is used to create office buildings, homes, bridges, wind turbine towers and other edifices. While MIG welding was initially developed for aluminum and other non-ferrous metals, it is now increasingly used for steel as well. 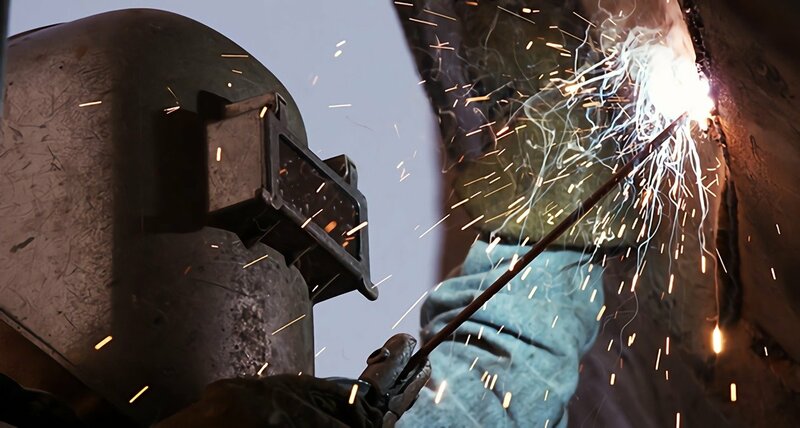 Because MIG welding is the welding option of choice4 for welding structural steel work, it is not surprising that the construction industry would be in need of MIG welders. MIG welding jobs in the construction sector are set to rise5 over the next decade, as the United States government invests money in infrastructure repairs. Another advantage of working in a construction-related welding occupation is that such jobs are less likely to be automated or semi-automated than other types of welding jobs. Those with up-to-date welding training, including in the latest industry technologies, will have the best job prospects 6. High production manufacturing involves the mass production of an item. This type of manufacturing is used to create, for example, computer components, auto parts, ship parts and many other items. The fact that MIG welding is cost-effective and quick7 makes it ideal for use in high production manufacturing. Another reason why MIG welding is commonly used this sector is that can be utilized on many types of metals. These include steel, aluminum, magnesium, carbon steel, nickel and various alloys. If you are looking for a MIG welding job in high production manufacturing, you will find that there are a variety of opportunities to choose from. Statistics show8 that up to 60% of all welding jobs are found in the manufacturing sector. Particular MIG welding tasks may include working with fabricated metal products, mining machinery and agricultural products, constructing parts for ships and boats, and creating office and home furniture. At the same time, it should be noted that many MIG welding jobs in manufacturing and the automotive industry are being taken over by robotics. However, this does not necessarily mean that there are fewer jobs openings for MIG welders in these fields, as human welders are still needed to handle and supervise these robots. Welding inspectors, technicians, machinists and programmers are in demand in this sector and have the potential9 to earn a high median annual wage. MIG welding is easy to learn and can lead to multiple job opportunities. Even so, it is important to note that this type of welding is evolving with technological advances. Learning this technique in a vocational welding program can provide aspiring welders with the training and expertise needed to qualify for a variety of jobs of the future.